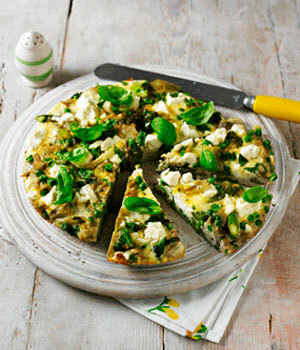 This quick and easy potato, asparagus and feta frittata is guaranteed to get everyone talking. Why not serve it already sliced so everyone can see the colourful centre? Ready in 30 mins for just £1.16 per serving. 1. Heat the oil in a non-stick frying pan over a high heat. Add the potatoes and fry until they’re just beginning to crisp – about 8 mins. 2. In a bowl, whisk together the eggs, spring onions, asparagus and petite pois and season. Heat the grill. Tip the egg mixture into the frying pan with the potatoes, mix quickly, then lower the heat. after about 8 mins, once the top side has almost set, place under the grill for 2-3 mins or until form and golden. 3. Remove from the pan, sprinkle over the cheese and basil and serve straight away.